Link to the full Colorado Daily Status Report for April 30, 2018. 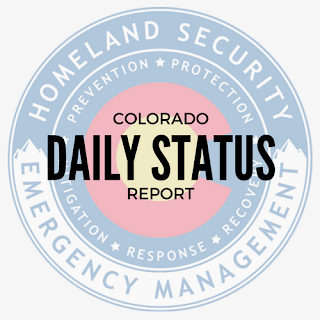 Link to the full Colorado Daily Status Report for April 27, 2018. Link to the full Colorado Daily Status Report for April 26, 2018. 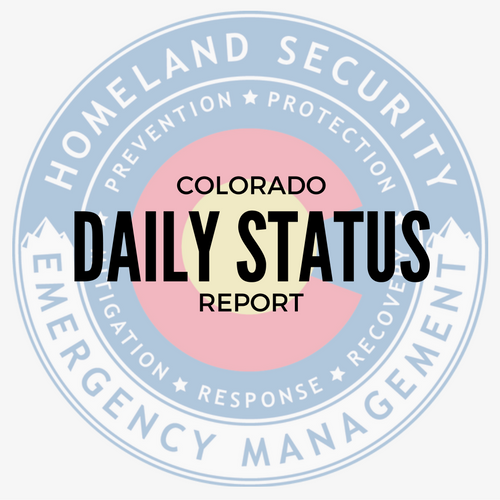 Link to the full Colorado Daily Status Report for April 25, 2018. Link to the full Colorado Daily Status Report for April 24, 2018. Link to the full Colorado Daily Status Report for April 23, 2018. Level 4:Routine operations and activities, including ongoing statewide coordination and information integration. Structures Report of damaged and destroyed homes. Link to the full Colorado Daily Status Report for April 20, 2018. Level 2: Enhanced operations with an identified situation or threat requiring coordination with one or more additional state agencies. Link to the full Colorado Daily Status Report for April 19, 2018. Transition to Level II at 7:30 p.m. on April 17, 2018. Resource Mobilization Fund approved by Director Klein at 1:50 p.m.
View the Current Colorado Fire Map. It is always posted in the right hand column of this website for your viewing. Link to the full Colorado Daily Status Report for April 18, 2018. 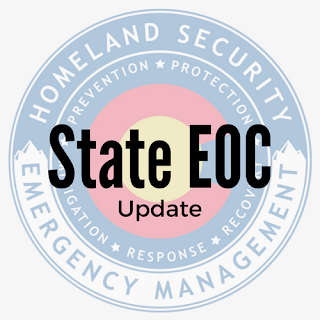 The State EOC transitioned to a Level III in support of Douglas County wildland fires at noon on April 17, 2018. Link to the full Colorado Daily Status Report for April 17, 2018. Link to the full Colorado Daily Status Report for April 16, 2018. Link to the full Colorado Daily Status Report for April 12, 2018. Link to the full Colorado Daily Status Report for April 13, 2018. The State EOC transitions to Level 3 activation to provide enhanced monitoring and support to the Double Fork Fire. Link to the full Colorado Daily Status Report for April 11, 2018. Link to the full Colorado Daily Status Report for April 9, 2018. Shared on behalf of the U.S. Small Business Administration. SACRAMENTO, Calif. – Small nonfarm businesses in 13 Colorado counties and neighboring counties in Kansas are now eligible to apply for low‑interest federal disaster loans from the U.S. Small Business Administration, announced Director Tanya N. Garfield of SBA’s Disaster Field Operations Center-West. These loans offset economic losses because of reduced revenues caused by drought in the following primary counties that began Jan. 23, 2018. Neighboring Kansas counties: Greeley, Hamilton and Stanton. By law, SBA makes Economic Injury Disaster Loans available when the U.S. Secretary of Agriculture designates an agricultural disaster. The Secretary declared this disaster on March 29, 2018. The deadline to apply for economic injury is Nov. 29, 2018.